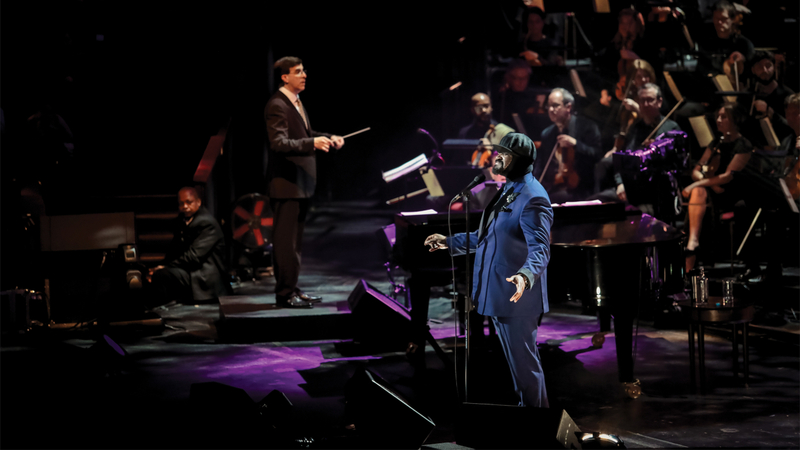 The phenomenon Gregory Porter surprised everyone when he first visited Copenhagen and the Copenhagen Jazz Festival in 2014. The concert was a huge success, which ended in a genuine, historical festival moment, when Stevie Wonder himself was invited on stage. In 2016, he returned to the jazz festival with brand new songs, and in 2018 Porter finally visited Musikhuset Aarhus. In 2019 he returns! Gregory Porter comes fresh from the release of his first live album. In November, he released One Night Only - Live At The Royal Albert Hall, which was recorded at three sold-out concerts at the iconic Royal Albert Hall in London. In October 2017, the double Grammy winner Gregory Porter released his new album, "Nat King Cole & Me", a tribute to his great idol, legendary pianist and artist Nat King Cole. The album is made in collaboration with, among others, the 6 time Grammy winner Vince Mendoza, The London Studio Orchestra, bassist Reuben Rogers, pianist Christian Sands, drummer Ulysses Owens and special guest trumpeter Terence Blanchard. On the album you can experience Porter's interpretation of some of Cole's most memorable classics such as "Mona Lisa", "LOVE", "Nature Boy", and "The Christmas Song" which is already available via stream and download just like the single "Smile" also is. Cole already had an early impact on Porter's life and music "He was one of a kind. He left such great music - to be able to help but be influenced by that extraordinary timbre, style, and ultimate cool, ”says Porter. “It's only natural that I go to the root of my inspiration and where I come from. And that root would be my mother and gospel music and Nat King Cole ”, Porter has stated. The 47-year-old American jazz singer released his first album in 2010 and already then showed off his great talent, and the album was nominated for a Grammy in the Best Jazz Vocal Album category. The title song of his second album, two years later, was also nominated for a Grammy in the Best Traditional R&B Performance category. Porter had to wait until 2014 before he received a Grammy award, when he won Best Jazz Vocal Album. Bass master Marcus Miller visits Aarhus, after releasing the genre-defining new album, Laid Black, in 2018. Marcus Miller is unique in terms of his extensive musical career. He has won two American Grammys, has received an Edison Award for Lifetime Achievement in Jazz and has been named UNCESCO Artist for Peace. His characteristic bass sound has contributed to the music of a wealth of great names ranging from Luther Vandross over Herbie Hancock to Eric Clapton, Aretha Franklin and Elton John.